A Picasso by Jeffrey Hatcher, Salem Theatre Company, 4/26/12-5/19/12, http://www.salemtheatre.com/on_stage.htm. (Salem, MA) With nowhere to go, two characters bounce off each other, alternating between affection and violence. Their relationship follows a familiar trajectory. The World War II bunker where both are trapped is a well-mined setting, too. 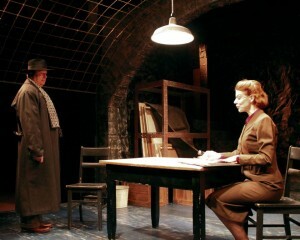 Still, it’s satisfying to watch Pablo Picasso (Stephen Cooper) and his German interrogator, Ms. Fischer (Linda Goetz), scrape each other raw in The Salem Theatre Company’s production of A Picasso.